China's growing importance on the world stage means that the West needs to start speaking its language, says economist Martin Jacques. My son has been learning Mandarin Chinese since he was five; he is now just 14. It has not been easy. Learning Chinese has required a deep pocket and the determination of an Olympic athlete. For nine years, he fed on the scraps of a veritable army of part-time tutors, each one lasting a year or so if we were lucky. The reason? Until 12 months ago it wasn't possible for him to learn it at school - French, Spanish German, Latin, even Ancient Greek, no problem. But not Chinese. Even now, alas, it is very much a second-class subject. His lessons take place during the school lunch break. The reluctance of the educational system - public and private - to grasp the Chinese nettle is a metaphor for a much wider problem: our ignorance about China and our failure to appreciate just how much it will change the world and transform our lives. With unerring regularity, our predictions about China have proved mistaken. Take its economy. In 1980 it was one-20th of the size of the US, today it is half the size and closing rapidly. Throughout that period, the doubting Thomases were always in a large majority. It would not last, sooner or later it would all end in tears. Why have we managed to get China so wrong? The reason is hardly rocket science. We insist on viewing it through a western prism. For the best part of two centuries, Western societies have seen themselves as the model for all others. But China isn't like us. It never has been and never will be. The great task facing the West over the next century will be to make sense of China - not in our terms but in theirs. We have to understand China as it is and as it has been, not project our own history, culture, institutions and values onto it. It will always fail that test. In truth such a mentality tells us more about our own arrogance and lack of curiosity than anything about China. Let's take one example. We assume that the nation-state, that long-standing and remarkably influential European invention, is more or less universal. True, China has called itself a nation-state for about a century. But 100 years is a mere pin-prick for a country that dates back over two millennia. Modern China emerged in 221. By the time of the Han dynasty - still more than 2,000 years ago - China's borders already closely resembled those of eastern and central China today. China is very old, the longest continuously-existing polity in the world. And for more than 2,000 years, it was not a nation-state but a civilisation-state. In essence it still is. Our own sense of who we are, and what we are, is overwhelmingly shaped by our sense of nation, as it is for every Western country. China is different. The things that define for the Chinese who they are and what China is are a product not of the past 100 years of calling itself a nation-state but 2,000 years of being a civilisation-state. China is changing faster than any other society in human history. Yet at the same time it continues to enjoy a unique and extraordinary intimacy with its own history. On my countless visits to China I am always fascinated and intrigued by this paradox. Don't be surprised if a Beijing taxi driver quotes an old sage or two from 3,000 years ago in a conversation about the present. History, even far distant history, is right there in the rear-view mirror. The values associated with Confucius, who lived 2,500 years ago, continue to shape and mould social attitudes such as harmony, stability, order, or the state as a microcosm of the family. It is no accident that the Chinese write the family name first followed by the given name. It reflects the overriding importance of the family in Chinese history. Then there's the ancient roots of Chinese food and indeed Chinese medicine. Civilisation is what defines China. "In the 5th Century BC, Europe had Socrates and China had just had Confucius. Both philosophers thought hard about ethics, and the right relationship between the individual and the state." The country has another remarkable characteristic in this context. It is huge, a continent in its own right as well being home to 1.3bn people, one-fifth of the human race. Although we tend to see China as highly centralised, it would be impossible to run a country of such size and immense diversity from Beijing. Its provincial governments have enjoyed great power, with the largest having far more authority than the great majority of the world's nation-states. But what in practice does it mean to be a civilisation-state? You may remember the handover of Hong Kong by Britain to China in 1997. Under the new constitution, known as the Basic Law, China proposed that Hong Kong would be run on the principle of "one country, two systems". The vast majority of us, I suspect, hadn't got a clue what it meant. I am sure that we overwhelmingly believed that, soon after the handover, Hong Kong would become more or less indistinguishable from the rest of China. Over 15 years later, it is abundantly clear we were wrong. Hong Kong is at least as different - politically and legally - from the rest of China as it was in 1997. The Chinese really did mean one country, two systems. Why didn't we believe them? Because we are a nation-state and think like a nation-state. Take the reunification of Germany in 1990. What happened? The old East Germany disappeared. The new united Germany was the old West Germany writ large. It was the natural solution for a nation-state - one country, one system. But it is impossible to rule a civilization-state of China's scale on that principle. For 2,000 years, China has operated in varying degrees according to the principle one country, many systems. The country could not be held together on any other basis. In this light, it was entirely logical for China to embrace Hong Kong on the basis of one country, two systems. If Taiwan should decide at some point that its future lies with China and that it should accept Chinese sovereignty, I think the Chinese will offer the Taiwanese the same deal - one country, two systems. But they will likely go further and give an undertaking that Taiwan can retain universal suffrage and its present multi-party system. Because what really matters to the Chinese is not the system but the principle of their sovereignty. So, let's now imagine a world in which the dominant power is no longer a nation-state, like the United States and before that Britain, but a civilisation-state. I suggest that over time - and I mean many decades - the world will come to look very different. The European-inspired nation-state system will progressively give way to a more pluralistic world. 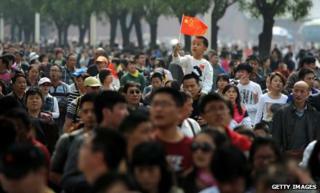 The rise of China will encourage other countries to think of themselves differently. India is not a civilisation-state in the manner of China, but it too is the product of a great civilisation. Turkey too, and likewise Iran. The decline of the West will undermine the strait jacket of the nation-state. The idea of China as a civilisation-state is the key to many other aspects of China. We cannot understand why - quite remarkably - over 90% of Chinese think of themselves as of the same race without reference to it. Or why the state enjoys such authority and reverence amongst the Chinese even though it lacks a Western-style democracy. If we persist with our present mindset, then don't be surprised if we continue getting China hopelessly wrong. Worse, with the relentless rise of China and the long-term decline of the West, we will find ourselves increasingly unfamiliar with a China-centric world and feel more and more like outsiders. That's exactly what happened to China, to its huge cost, after 1800 with the rise of the West. Despite all the obstacles, my son's Mandarin Chinese is coming along nicely. The task is formidable: you have to learn thousands of characters and a host of entirely unfamiliar sounds. It is estimated that it takes at least twice as long to learn as a European language. The language is a metaphor for China. Understanding the unfamiliar requires a different mentality: rather than superiority, hubris and presumption, which have I think been the dominant Western attitudes towards China, we'll need respect, humility and modesty. Will we respond to the challenge? The stakes could not be higher.